Two shapes are congruent if they are exactly the same shape and size. Technically speaking, this means that all the side-lengths and angles are the same. One way to understand this practically is to imagine yourself cutting two shapes out of paper. If you can make one of the shapes fit perfectly on top of the other shape (you’re allowed to flip the pieces of paper over and rotate them), then the two shapes are congruent. Example: Identify two pairs of congruent shapes from the options below. Looking at shape A, if we were to rotate it by 90\degree then it would fit perfectly onto shape C, so they must be congruent. Additionally, we can see that they’re both rectangles (so all angles are immediately the same) that are 1 square wide and 3 squares long. This is an extra clarification that they are indeed congruent. For the second pair, looking at shape D, we can see that if we take the mirror image of it (which is the same thing as flipping over a paper cut-out), then the result will fit perfectly on top of shape H. Therefore, they must be congruent. It’s more difficult here to break down the individual angles and side-lengths to double-check the congruence like we did with the first pair but that’s okay – this was only an extra clarification, it’s sufficient to recognise that one fits on top of the other. RHS – right-angle, hypotenuse, side – a right-angle, the length of the hypotenuse, and the length of one other side. Each of these tests comes with its own acronym. You should be able to work out if two triangles are congruent and then state (by writing the acronym, e.g. SSS) which test you used to determine this. Example: State which test you can use to prove that these two triangles are congruent. We can see that both these triangles have one side that is 3.2cm long, another which is 4.5cm long, and the angle between those two sides is 48\degree in both triangles. In other words, this pair of triangles passes the SAS test for congruence. Example: Determine which triangle(s) out of B, C, and D is/are congruent to A. State which test(s) for congruence you used. Let’s check each shape individually. Shape B: it has two angles in common with A, but the side is a different length. Shape C: this has two angles and a side-length in common with A, but to pass the ASA test the side-length needs to be between the two angles, which in C’s case it isn’t. Shape D: this does what shape C didn’t – all the numbers match, and the side we know is between the two angles which means that shape D is congruent to A by the ASA criteria. The real value in being able to spot when two triangles are congruent like this is that we suddenly know that all the other angles and side-lengths must also be the same. This is useful in making quick leaps towards solving bigger problems, for example in circle theorems, so keep the definition of congruence as well as the 4 tests for congruent triangles in mind when solving all kinds of geometry problems. 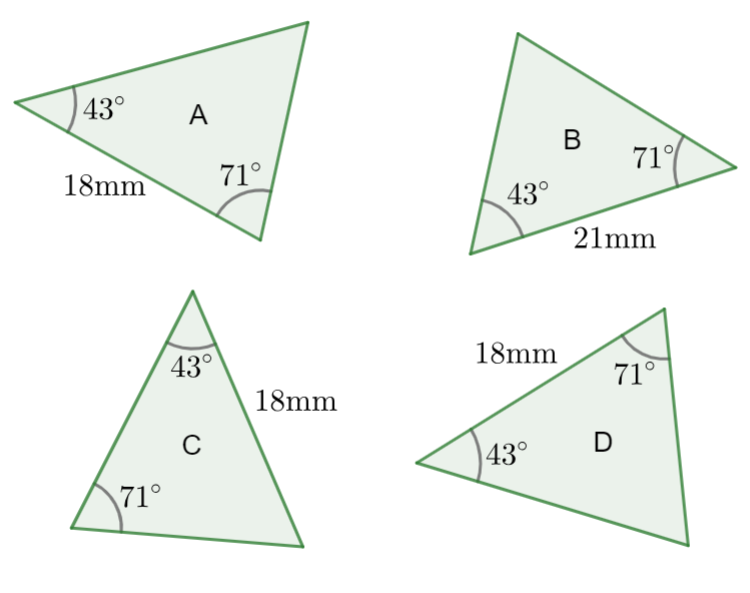 1) Identify 2 pairs of congruent shapes from the options below. If we were to take shape B and move it downwards and to the left it would fit perfectly on top of shape F, without any need for rotation or flipping. Shapes B and F make the first congruent pair. 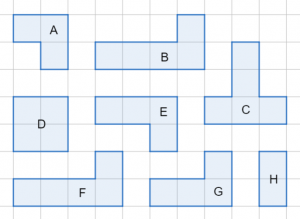 If you were to move shape E slightly to the right, you would see that it is the exact mirror image of shape G. In other words, if we were to cut out E and flip it over, the result would fit perfectly onto shape G. Shapes E and G make the second congruent pair. 2) Determine which of the following four triangles are congruent. State which test for congruence you used. 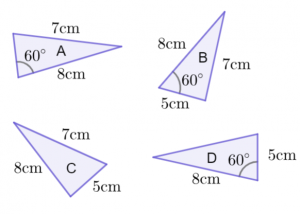 The first thing we should notice is that triangle B actually has more information than we need to test for congruence – all 4 tests require 3 bits of information, but this one has 4. Given this wealth of information, let’s see if anything is congruent to B.
Triangle A: this does have an angle and two sides in common which suggests SAS congruence, but the angle is not between the two known side-lengths, so it is not congruent. Triangle C: this has 3 side-lengths in common with B, so it must be congruent using the SSS criteria. It doesn’t matter that there’s an extra known angle in A.
Triangle D: this time, we have an angle and two sides in common with B and the angle is in the right place, so it is congruent to B by the SAS criteria. So, we know that C and D are both congruent to B, or in other words, B, C, and D are all congruent to each other. 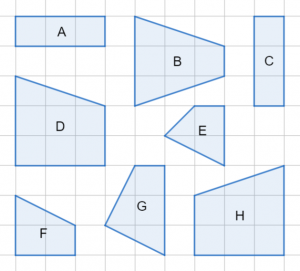 Given that we determined A was not congruent to B and B has the information of C and D combined, then A must not be congruent to anything, so it remains just B, C, and D.
If you are looking for congruent shape homework sheets to set your students or you need some inspiration for the new GCSE Maths lessons you are devising then you will find them on this congruent shapes resource page. For a whole host of other topics please visit our specialist GCSE Maths revision page. Whether you are a Maths teacher in London or you tutor GCSE Maths in Harrogate, the resources we supply will be of use.